Parson’s Beach, Kennebunk ME. The Rugosa Rose (or Beach Rose) on the dunes behind Parson’s Beach is breeding ground for Yellow Warblers every spring. 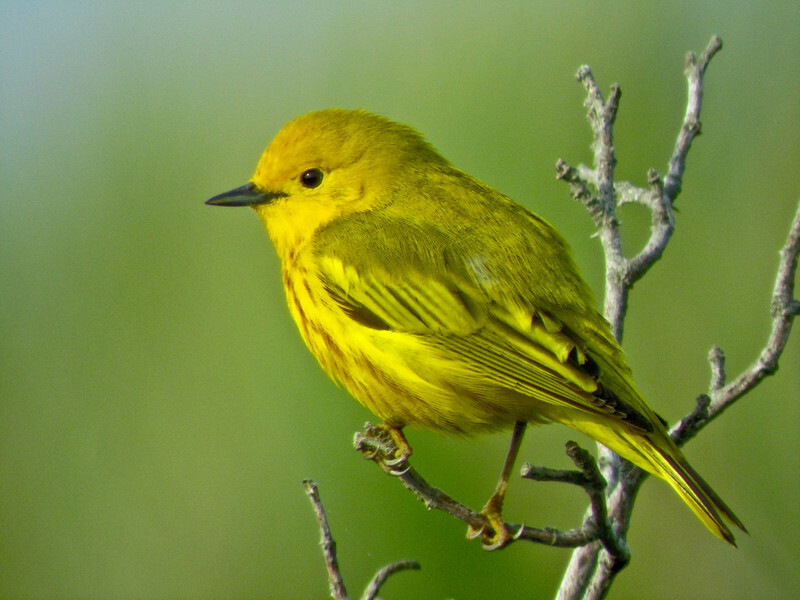 They are so active that it is hard to determine how many pairs, but at least 3, maybe 4 (and maybe more) pairs of Yellow Warblers compete with the Song Sparrows and Catbirds for sonic dominance of the dunes…at least until the resident Mockingbirds arrive. This shot is digiscoped using a small pocket camera behind the eyepiece of a spotting scope. I was about 30 feet from the bird. As presented here, the bird is about 7/8 life size…but you can see it much larger by following the link and playing with the sizes across the top of the window on WideEyedInWonder. The light was subdued by cloud cover, so the ISO was pretty high for feather detail. Still. Canon SD1400IS behind the eyepiece of a Zeiss Diascope 65FL. Equivalent focal length, more than 4000mm. Exif data: f5.9 @ 1/200th @ ISO 320. Programmed auto. Actual f-stop, based on real focal length and scope aperture, was more likely in the range of f10. Processed in Lightroom 3 Beta. A touch of Fill Light, Blackpoint right, added Clarity and not much Vibrance at all. Sharpen landscape preset. I used the Beta because of the superior sharpening and noise reduction in version 3. Combined with subtle changes in the other processing routines, version 3 maintains more detail and finer color variations much better than version 2. On most shots it does not matter all that much, but on a shot like this were both detail and color are essential, it certainly makes a difference. I am eagerly anticipating the final version. We reached the Highpoint/Stokes Recreation Area soon after dawn in our World Series of Birding run on Saturday. One of the advantages of only being there to document the effort is that I had time (and attention) to spare for things without wings…like this angler in a pond in the early light. 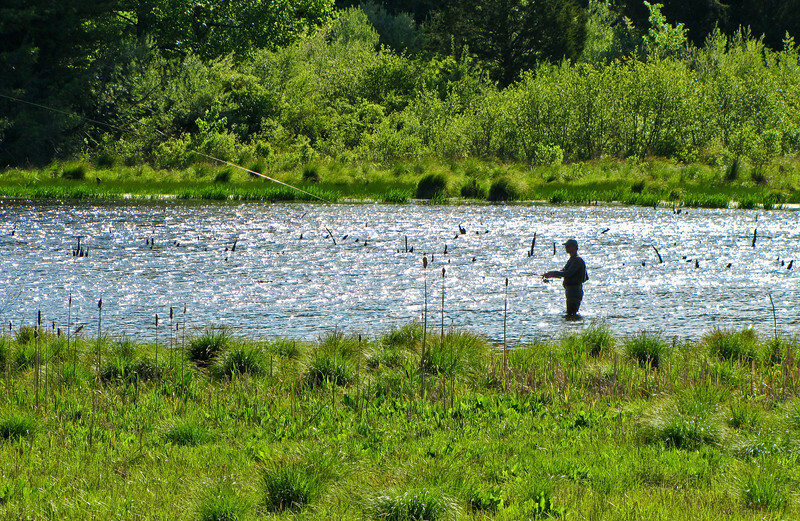 Zooming in, I as able to catch the arc of the line as he cast. This will repay a view at larger sizes on WideEyedInWonder (click the image for the link, and use the size controls at the top of the window to resize for your monitor). Canon SX20IS at about 280mm equivalent. F5.0 @ 1/400th @ 1SO 80. Landscape program. In Lightroom, a touch of Recovery for the glittering water, some Fill Light and Blackpoint right, added Clarity and Vibrance. Cropped from the bottom and top for composition. From World Series of Birding 2010. 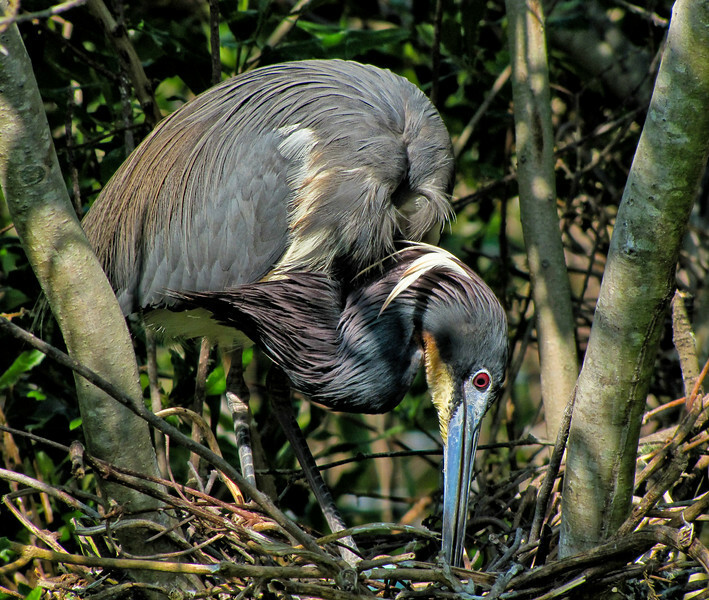 Tricolored Herons nest low, mostly in mangroves, which places them, amazingly, delightfully, close to the boardwalks at the St. Augustine Alligator Farm rookery. Some are literally within reach of a long arm, and all are certainly within reach of your average P&S zoom. Tourists love them. 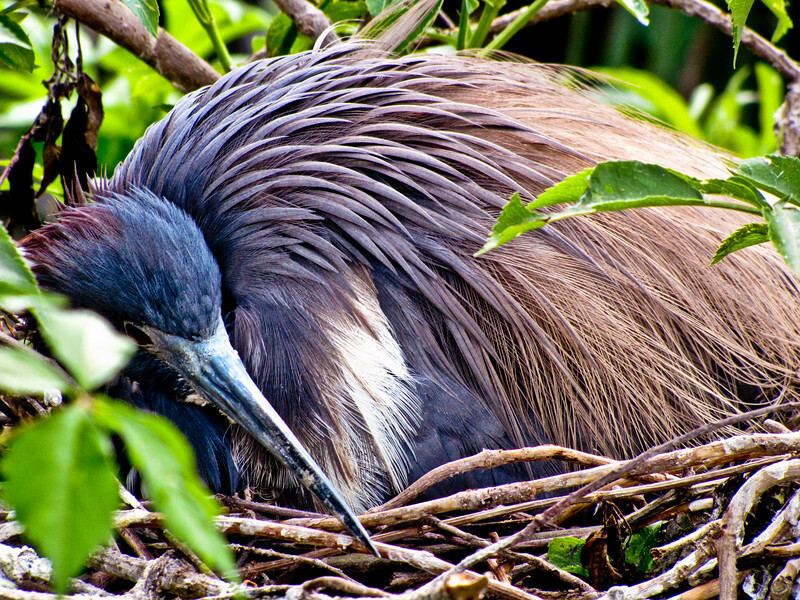 I (while not admitting to being a tourist) always come back with lots of Tricolor shots, so this will be a bit more than a Pic of the Day…kind of a Tricolored Heron retrospective. 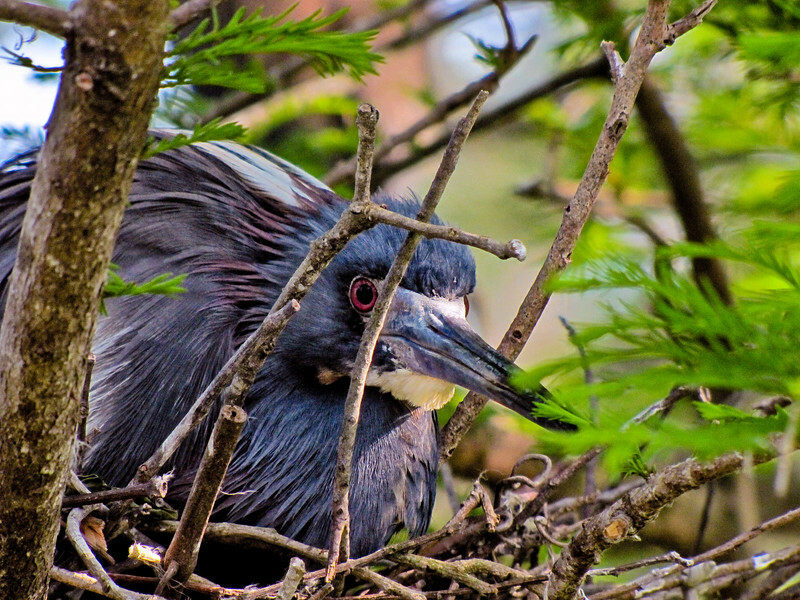 It is well to remember that, while taken in what amounts to a zoo, these are wild birds, attracted to what is apparently in their eyes, an ideal nesting site. They are not fed, managed, caged, clipped, or manipulated in any way. They are free and fully wild. While they might be habituated to close human presence on the boardwalk, they are not tame. 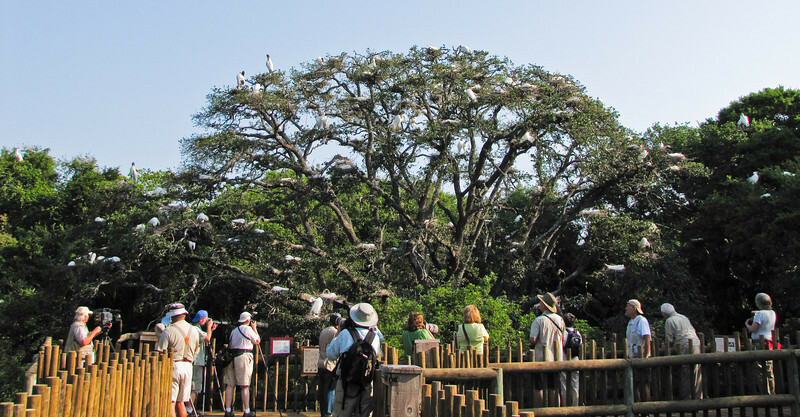 That is the real wonder of the Alligator Farm rookery. All shots were taken with the Canon SX20IS on my most recent day at the Alligator farm. All were taken at equivalent focal lengths of 520-560mm, @ f5.7 on programmed auto with –1.3EV exposure compensation. Shutter speeds and ISOs varied as the camera set them, with ISOs ranging from 100-320. All received similar processing in Lightroom. Basic Presence adjustments, Blackpoint and White Balance on the two in the shade, and the Sharpen landscape preset. And finally, a bit of video, also shot with the Canon SX20IS. 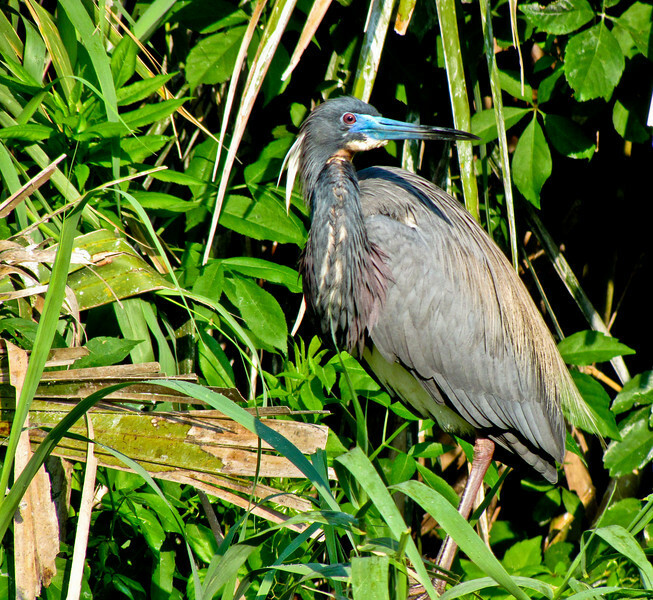 Gotta love those Tricolored Herons! Gotta love the Alligator Farm. Okay, so that is a really terrible pun. I admit it. 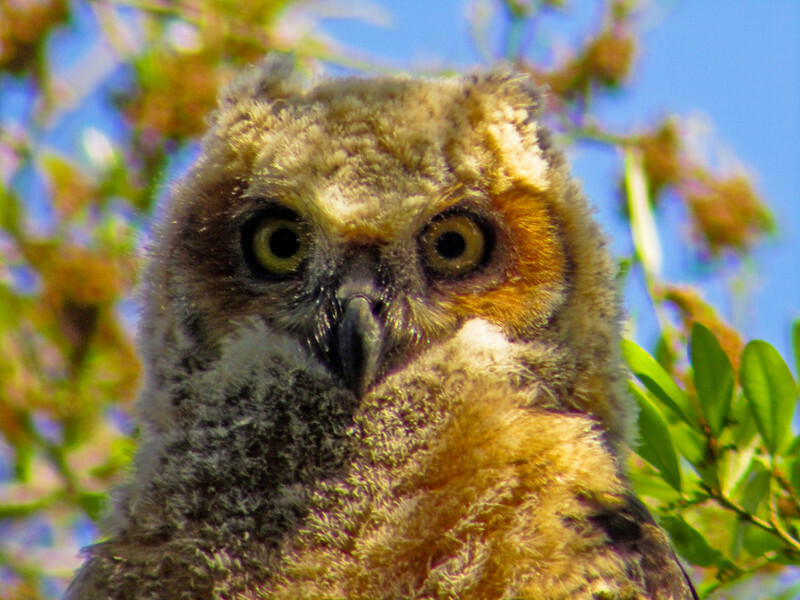 One of the things, I think, that makes us love owls, or at least respond to them as strongly as most folks do, is that the forward facing eyes and the beak give them the most human of bird faces. 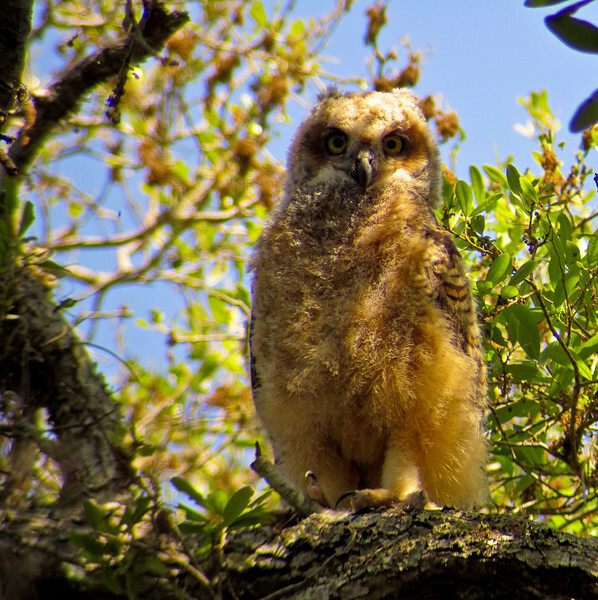 This Great Horned Owl chick exemplifies the attraction. He was actually not all that interested in the group of noisy photographers and digiscopers gathered, for like the 6th day in a row, under his day-roost tree, but when a tourist dropped by with a dog on a leash, it was suddenly all whoo goes there! I am not sure if it was prey or predator behavior (it was a small, snack-sized, dog…but it was a dog) but the owl was certainly all attention. Good for me. I was already all attention and got the shot. Canon SD1400IS behind the eyepiece of a ZEISS DiaScope 65FL. If you do the math: true focal length x sensor crop factor x scope magnification, you get an equivalent focal length of just over 3300mm. EXIF data says F5.9 @ 1/100th @ ISO 320, based on Programmed auto. Limiting F-stop, based on magnification and the 65mm scope, was actually, again according to the math, f9.2. In Lightroom, just a touch of Recovery for the bright background. A bit of Fill Light. Blackpoint right. Added Clarity and a smidge of Vibrance. I had to use the Auto White Balance in Lightroom to tame the yellow cast that all that brought out based on the camera’s auto white balance. From St. Augustine FL 2010. And here is a shot pulled back some to show the whole chick. 2000mm equivalent at F6 (computed) @ 1/200 @ ISO 125. Programmed auto. Similar treatment in Lightroom. 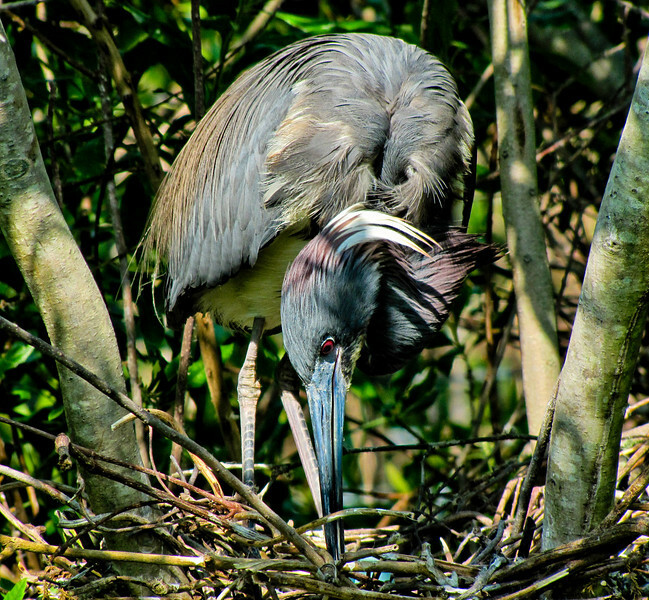 Of course, one of the wonders of the St. Augustine Alligator Farm is that you are able to get close, really close, to some of the nesting birds. 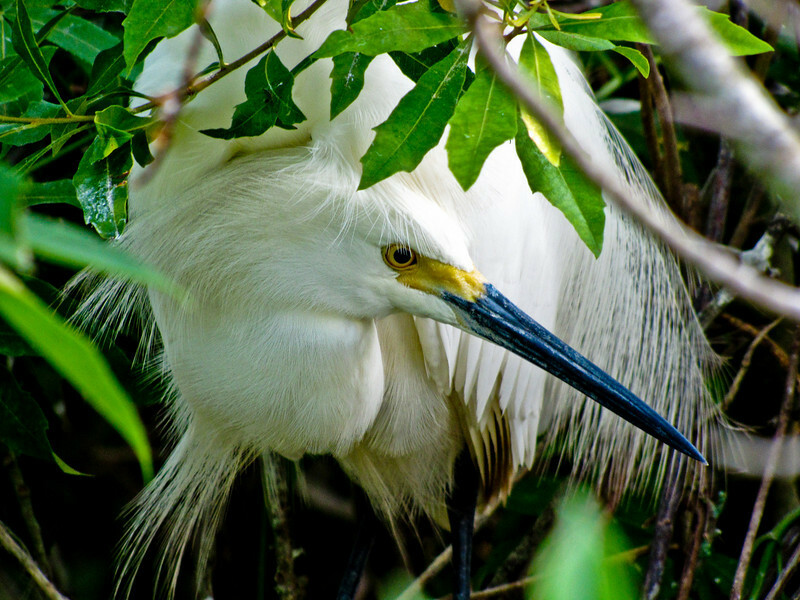 This Snowy Egret shot was taken at the 560mm equivalent on the SX20IS. I did not have to switch to macro but it was almost there. 🙂 And of course, this close, you get wonderful detail. I have shots like this taken through the eyepiece of the ZEISS DiaScope spotting scope (digiscoped), but that is a different experience: a closeness without intimacy somehow. This is intimate. Canon SX20IS at 560mm equivalent. F5.7 @ 1/60th @ ISO 200. Programmed auto with –1.3 EV exposure compensation. Technically, I am very pleased with the SX20IS’s performance at ISO 200 here. In Lightroom, just a touch of Recovery for the white highlights, a bit of Fill Light for shadows, and then Blackpoint to the right. Added Clarity and a smidge of Vibrance. Sharpen landscape preset. 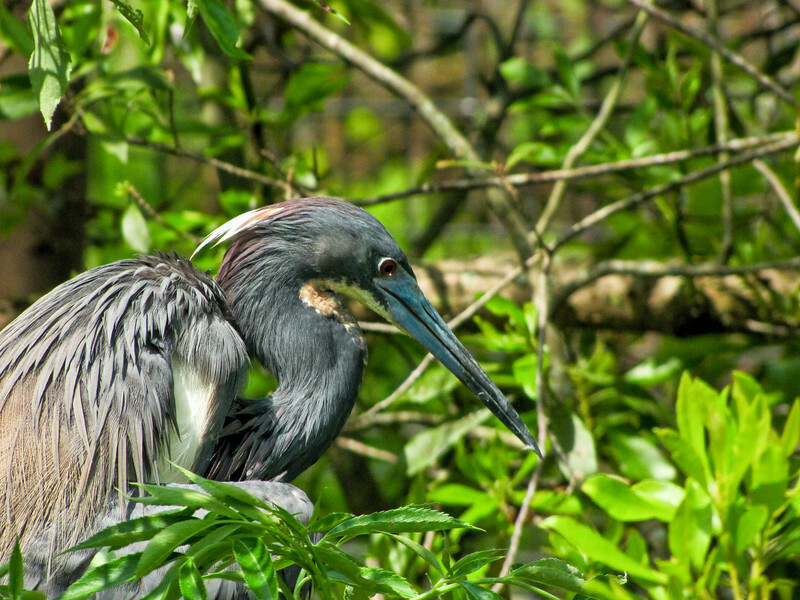 The St. Augustine Alligator Farm and Zoological Park is one of the premiere bird photography spots in the US (if not the world). When they built a “native swamp” habitat, stocked it with their overflow of alligators, and built a boardwalk right through the middle of it, they inadvertently created one of the most productive, and certainly one of the most accessible, rookeries of wading birds in the world. Wood Storks; Tri-colored Herons, Green, and Little Blue Herons; Great Egrets and Snowy; Roseate Spoonbills, White and Glossy Ibis are all colonial nesters, and they all moved in to the trees and mangroves over the alligator infested waters…where, strangely enough, they feel safe. The alligators act as really viscous watch dogs and keep the real predators at bay. The Alligator Farm itself is not your typical roadside alligator attraction. They have the only complete collection of alligators and crocodiles in the world, are members of the Association of Zoos and Aquariums, and have a full time staff of trained professionals who care for the animals and the enclosures in a truly impressive way. And in spring the rookery is in full swing. It is impossible to describe and even this picture does not do it justice. You will note that the density of photographers is just under that of the birds! 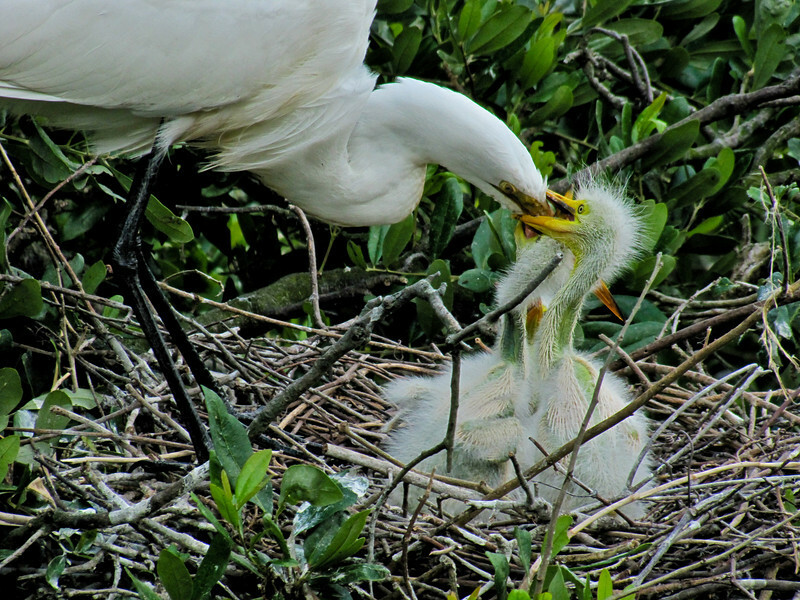 The shot of the Snowy Egret mom feeding chicks was taken at about 20 feet with the 560mm equivalent zoom on the Canon SX20IS. The bird had nested just below boardwalk level, where the boardwalk curves back out over the water between the big trees and mangroves. Ideal. F5.7 @ 1/320th @ ISO 125. Programmed auto. –1.3EV exposure compensation. In Lightroom, just your basic added Clarity and Vibrance and Sharpen landscape preset. And, for interest sake here is some video shot from the same spot. You can watch it in HD if you want. We went back to the pond behind the amphitheater on Jekyll Island for our digiscoping workshop, since, as they say, the pickings were easy there. 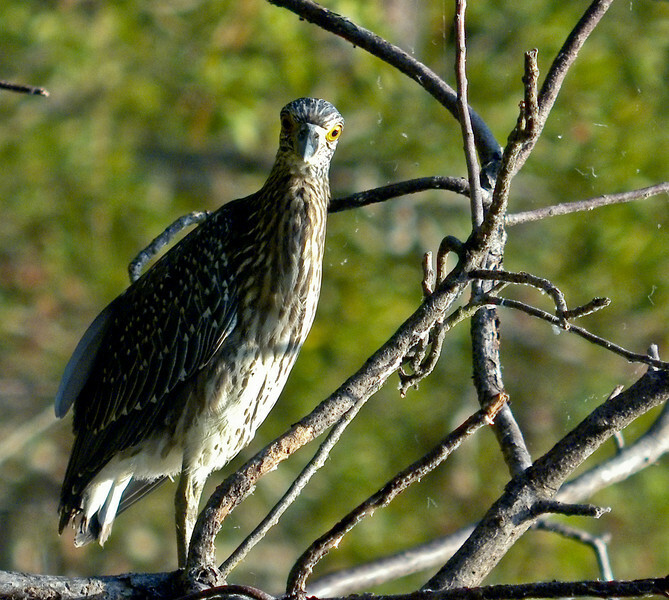 Lots and lots of immature Yellow-crowned Night Herons perched out in the early sun. I was tucked back in the shade of the trees on the bank, but this youngster must have seen the glint of the light in my objective lens. I certainly saw the glint of light in his eye. Zeiss PhotoScope at about 1400mm equivalent. 1/130th @ ISO 200. Approximately f5.0. Programed auto. A touch of Recovery in Lightroom for the feather highlights. Added Clarity and just a bit of Vibrance. Sharpen landscape preset. Cropped from the right for composition.